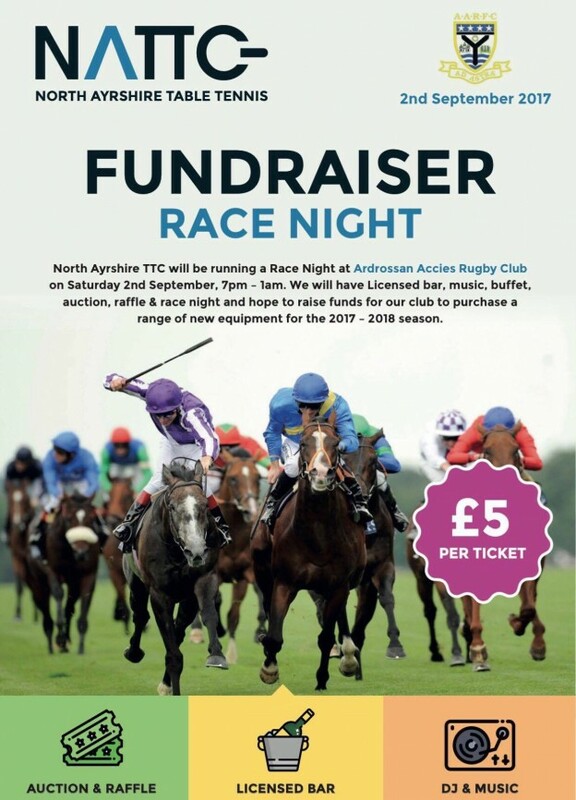 North Ayrshire Table Tennis Club are running a Racenight & Awards Night on Saturday Sept 2nd at Ardrossan Accies Rugby Club 7pm – 12pm, and is open children, juniors & adults. We will have a licensed bar, buffet, music, raffle, race night and awards for variety of our players and committee and will be a great night for everyone to catch up & socialise. These fundraising events are important to any club and will ensure we keep the costs low with the increase running costs we are seeing. NATTC are hoping to buy new equipment such as tables, barriers, nets this season and can only do so with more funding. We currently have 80+ people confirmed , but are hoping to have 100+ and are encouraging everyone to attend ( parents, players & friends ) if its only for a few hours or the full night. We will have flyers & racesheets available at the club tonight, and racesheet / flyer also attached to this email. This entry was posted in Latest News on 25th August 2017 by Chris Main.